The Talking Quilt is a collaboratively-made traditional textiles quilt chosen for its role as a domestic object, its ordinariness, and its capacity for collective meaning-making. Audiences wear a special glove that allows playback of oral history interviews with the staff, volunteers and visitors of the farm as they record their thoughts and memories around food and community. The research explored how new technology can augment everyday, domestic objects, bring them to life and create an enjoyable and reflective engagement without changing their qualities as visual, tactile and hand-made artifacts. It also looked at how socially meaningful themes integral to the quilt - i.e. food, food growing and community -	could be communicated through the interaction. Your Browser supports neither MP4 nor Ogg video formats. Sorry !!! Heitlinger, S., Bryan-Kinns, N., Stockman, T., O’Flanagan, O., and Couzyn, T. (2012). 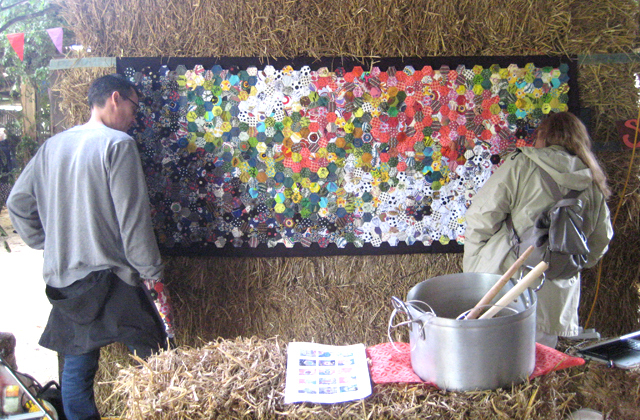 The Talking Quilt: Augmenting Domestic Objects for Communal Meaning-Making. In Proceedings of DIS 2012. Newcastle, Uk. Heitlinger, S., Bryan-Kinns, N., Stockman, T., O’Flanagan, O., and Couzyn, T. (2012). 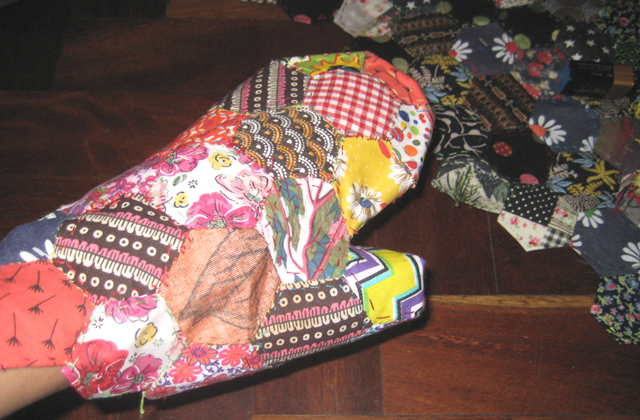 The Talking Quilt: Augmenting Domestic Objects for Communal Meaning-Making. In Proceedings of EVA London 2012. London, Uk.